The overarching goal of this blog is quite straightforward: tackle challenges and opportunities provided by this new era of open-access and computationally intensive research in the field of ecology. You will therefore find a collection of blog posts that reflect this: code snippets, ecological insights, new and exciting computational tools, opinions on various field of ecology and programming, etc. In the interest of full disclosure, we also have a hidden agenda for this blog. As a group revolving almost exclusively around academia (for more about us) - and as such, some might say out of touch with reality - we have to write a lot, which can be quite hard (cough read procrastination cough). This blog is therefore also our attempt at significantly stepping-up our writing game! 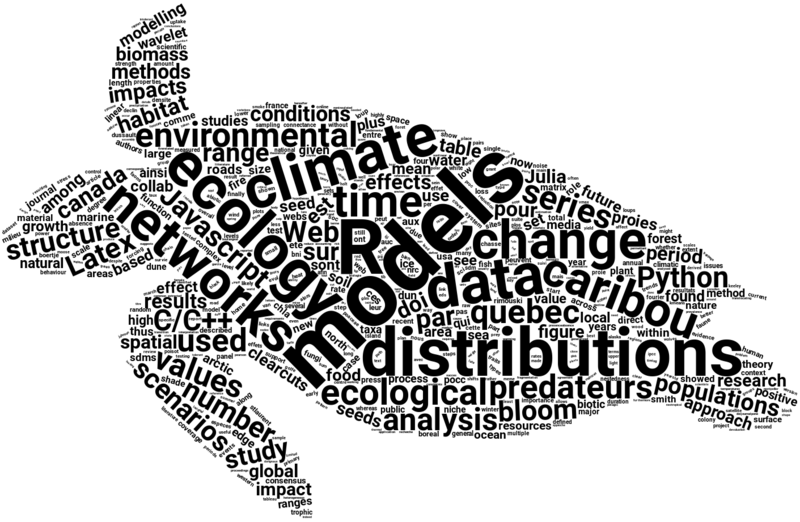 Wordcloud created with the wordcloud2 R package; silhouette image available on PhyloPic (Lepidochelys olivacea); full R script available on . © 2018 inSileco | All rights reserved | Powered by Blogdown, Hugo and Minimal.